Earn up to 2,792 reward points. Get the tonal essence of the legendary '59 Fender Bassman right from your pedalboard. The ZVEX Effects '59 Sound is based on the legendary 1959 Tweed Fender Bassman. 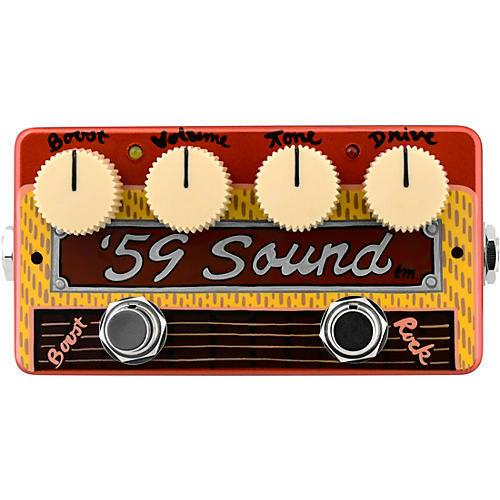 The hand-painted ’59 Sound captures the essence of that magical amplifier in a board-friendly size. It features Boost and Rock footswitches, and reacts beautifully with your guitar volume. The ’59 Sound also contains an extremely high-head room, unity-to-50X gain booster with 1 megohm input impedance and low hiss. It is very similar to the SHO boost circuit with refinements to make it sound more like a standard amp input and less glassy. The boost channel can be used alone or in conjunction with the distortion channel. The boost channel follows the distortion channel so that the distortion is able to hit your amp harder (at a higher volume) when both switches are engaged, for boosting solos and what-not. Look out when boosting what-not. Dimensions: 4.7" x 2.38" x 1.82"